I’m not a good loafer. Oh sure, I can waste time in front of the computer like anybody’s business, but that still involves attention and sitting upright and stuff like that. And then I get all multi-tasky: I could be doing laundry! The dishes are calling me! Isn’t it about time to organize the kids’ art supplies? So a day of “loafing” ends with all kinds of stuff done. This is normally a good thing, but I’ve been sick for about a month now with some mysterious horrible virus. It’s the basic upper-respiratory thing but because I now work nights and don’t sleep well during the day, and am somewhat anemic due to Things You Don’t Want To Know Anything About, I just can’t seem to kick it. So what is really called for is extreme loafage. Full-contact, no-holds-barred, combat loafage. Yesterday I tried to loaf, but my ear was bothering me a lot (pretty sure it was a blocked Eustachian tube) and the house was a mess and I just didn’t do a great job of relaxing. Today, though, I actually managed to sleep in a bit, and then in the afternoon when my plans had been derailed by the tub faucet malfunction I found that I was sleepy… so sleepy… and I crawled into bed and read for a while with a cat purring on my shoulder, and before I knew it — I was loafing! And then napping! There is hope for me after all! I’m not the girl I used to be. So I’m sitting at home drinking some nice French press waiting for our sidingwallah and general handyman to arrive and rescue me from this house. A few weeks ago he happened to still be here in the evening when we found that the bathtub cold water spigot would not turn off. He called a friend who knows about these things and after a quick trip to the hardware store and a minor expenditure for rubber washers and a new stem, he had it working again. All was rainbows and unicorns until we started having some difficulty getting it to regulate. It became trickier and trickier to get the temperature correct for a shower. And this morning I was all set to race through the shower and rush off to church when I found that the cold water once again won’t turn off all the way. Kenny is on his way, because he is a thoroughly decent guy, and I did make an attempt to go out front and turn the water off at the source. I did. But it’s not just a simple matter of opening a little metal cover and turning a knob. No, you need a wrench, and the inside of that hatch is deep and dirty and damp and has slugs in it. I had a wrench that might have been sufficient, but between the dirt, the damp, the slugs, and the not-knowing which way to turn the doohickey inside, I just walked away. Once upon a time I might have given it a try, but today I’m not feeling well and have a headache, and help is on the way, and it’s turning out to be worth the extra couple bucks’ worth of water running down the drain to not have to lay down on the dry grass and stick my arm into a cold dark smelly slimy hole and thrash a wrench around ineffectively. And now to sip more coffee and feel wretched. State Fair! A Photo essay. 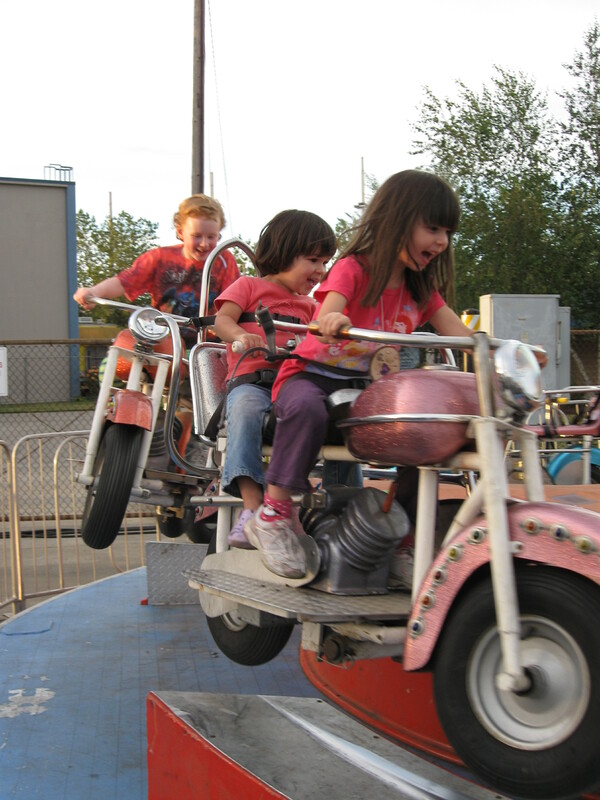 So we packed up the youngsters and hauled them more than an hour south to the Oregon State Fair. We had a three-point plan: Dinosaur exhibit, petting zoo, rides. Seeing as the youngest is 3, and the oldest a mere 6, we didn’t feel inclined to trudge through every barn full of animals (“Look, kids! Another chicken!”) or craft projects or geegaw booths. Although heaven knows we could use some Magic Towels and Super Squeegees and Wonder Mops around here. First stop: Dinosaur exhibit. 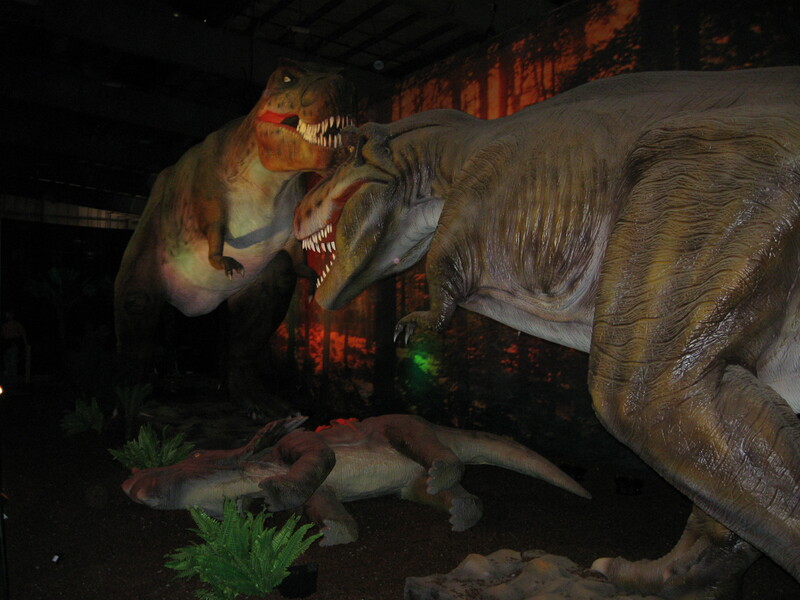 This was actually pretty fun, a bunch of dramatically-lit, motion-sensor-activated animatronic life-sized dinosaur models. Fairly reasonably priced, too, only 13 bucks for the whole crew. The older girls thought it was totally badass but the youngest found it to be a bit unsettling. 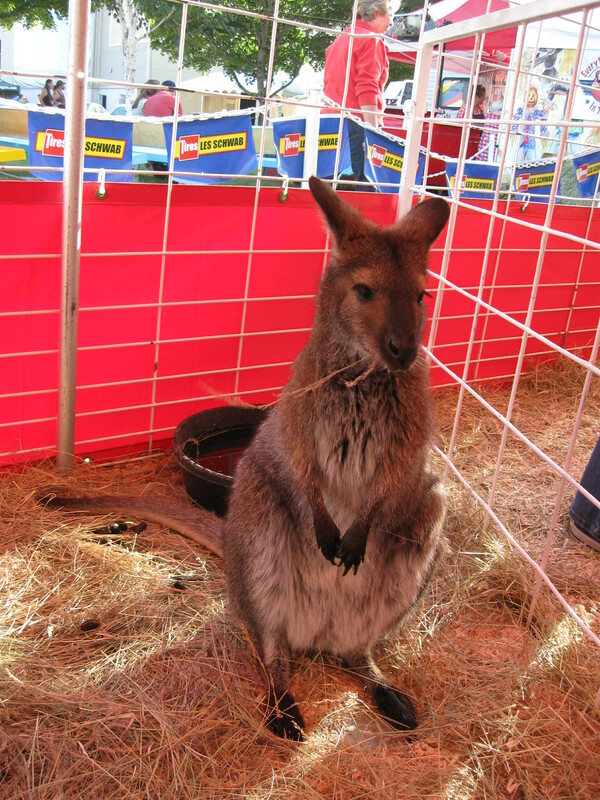 We then moved on to the petting zoo, where we found not just the usual selection of goats and sheep and pot-bellied pigs, but a few deer and a couple of wallabies! 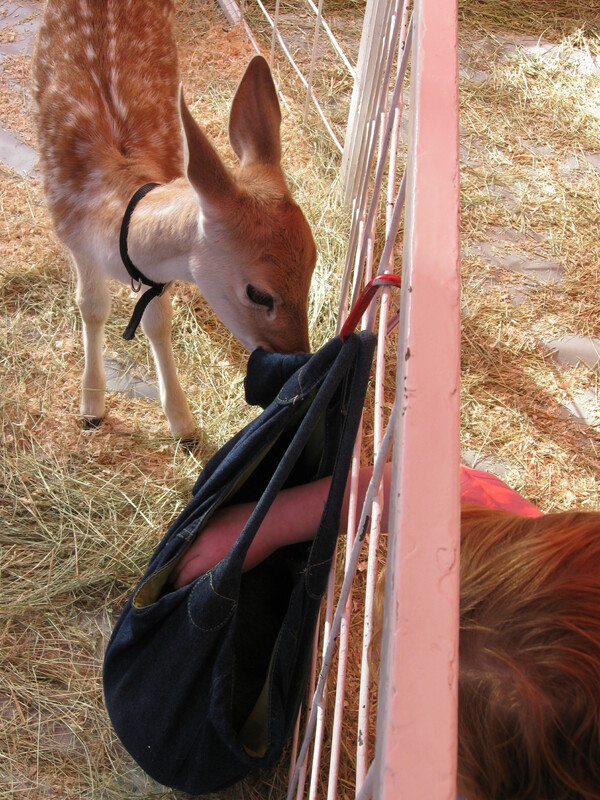 The deer liked to chew on clothing while the wallabies liked to stare off into space or hang around in pouches. 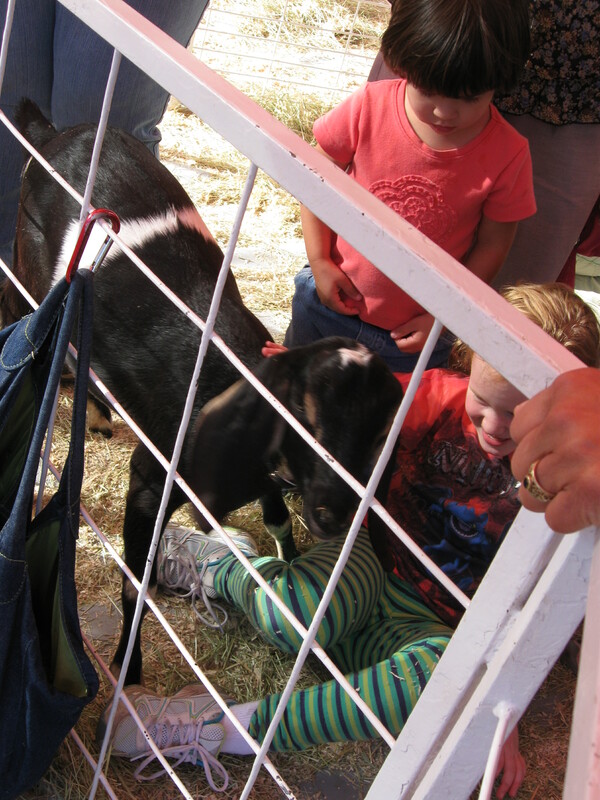 The goats were not shy and knocked more than one kid over if they thought food might be forthcoming. After a delightful fifteen minutes spent obtaining a liberal coating of livestock spittle and sawdust, we moved on (after visiting the thoughtfully placed HANDWASHING CHALLENGE! trailer) to enjoy the obligatory elephant ear and scone. The youngest marked the occasion by wetting her pants. This is par for the course lately so Rhonda immediately mobilized. Potty training knows no bounds! 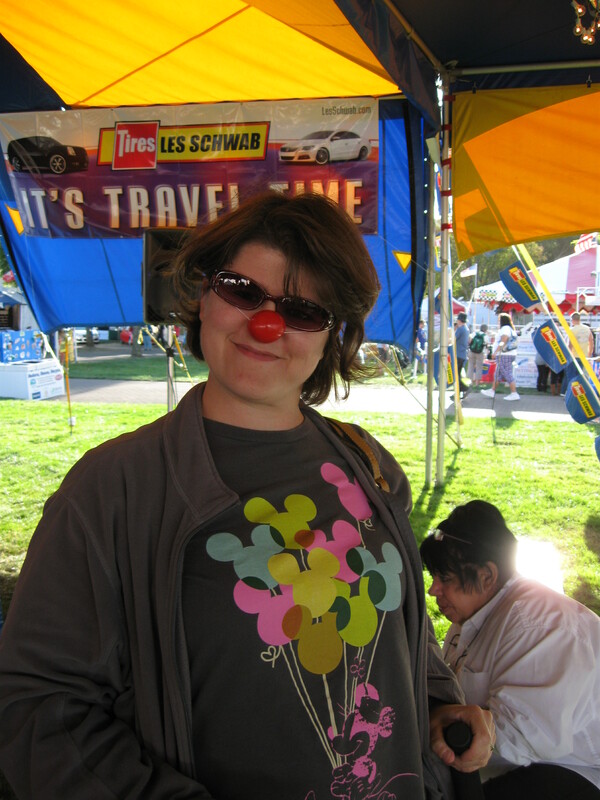 We happened to stumble across a clown show for kiddies. I’d show you the picture but I’m pretty sure it’ll be our Christmas card photo this year. Instead, here is Rhonda channeling her true identity. She starts online clown school in the fall. Then it was on to our final stop, the rides. We went ahead and took out that second mortgage so the kids could have some fun. And they did! Glittery pink motorcycles for everyone! I’m pretty sure they had fun. 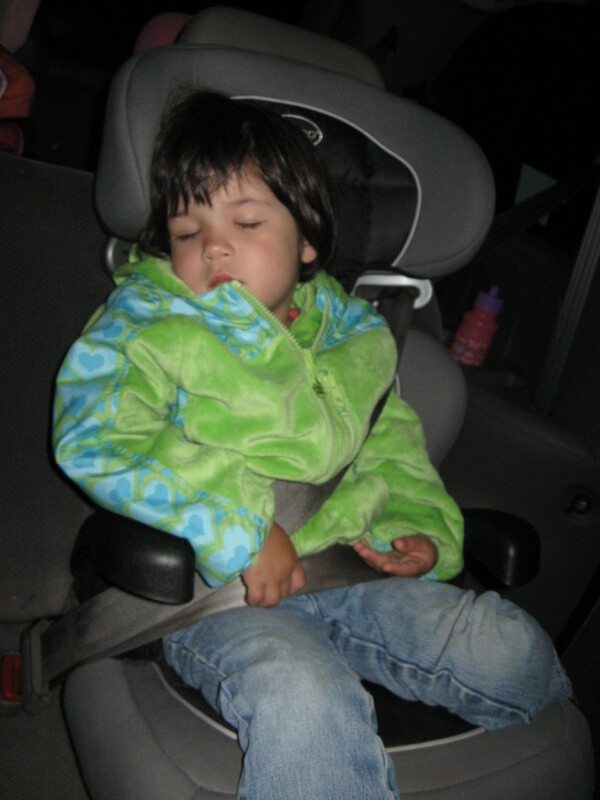 Two-thirds of them were asleep within fifteen minutes of getting into the car. The room is wired for heat and power, and Kenny can finish it up now. I am slooooooooooowly feeling better. Sort of. Despite getting about 3.5 hours of fragmented sleep, I managed to refrain from killing anyone today. All in all, generally speaking a successful day. Loaded up the Elder Spawn and went to the Ye Olde Outlette Shoppe Malle this afternoon for some power shopping. We hit paydirt at the first shoppe! Oshkosh had some great stuff, cute but not too “adult”, and the prices were fantastic! Look! I’m gushing! Somebody stop me! And I registered my email address with them (painless and can be un-registered if necessary) for coupons and got a 20% off coupon that I could use on the spot! Gah! STOP THE EXCLAMATION POINT MADNESS!!! But I can’t help it! So for a hundred bucks we got two skirt and top outfits, a dress and leggings outfit, two pairs of tights, two pairs of jeans, and a Halloween themed long sleeve shirt. That, my friends, is not bad. And I filled my exclamation point quota for the day! Yay! So, I have a six year old. She’s large, for six. She’s about 4’3″ and 65 pounds, and wears about size 8 clothing. And thus we begin the school shopping season with the usual complaints: children’s clothing for toddlers, up to 5T, is so cute. It’s child-appropriate and reasonably inexpensive. My only complaint about it is that the girl shorts are so much shorter than the boy shorts, and the girl pants tend to be more fitted than the boy pants (and therefore fit differently and sometimes don’t fit well at all). This only gets much, much worse when you hit the larger sizes. Little girls are expected to wear these tiny shorts and close-fitting shirts while boys get the usual cargo-type shorts and standard t-shirts. Girls’ pants have a lower rise and are more flimsy, and waaaay more buttcrack shows when they squat down. Girls’ dresses are all this Hannah Montana type crap, very insubstantial and too grown-up for age six. Where are the normal clothes? Jumper dresses and long sleeves? The answer to that is, in the more expensive shops. And it’s irritating to spend that much money on something that will fit for maybe six months. Times like this I wish I could sew. School Supplies! A cautionary tale. So we are shopping for school supplies for Elder Spawn and the Middle Child. Elder is six now and entering 1st grade, while Middle is five and starting kindergarten. What I recall about school supplies long ago in my misspent youth was that each child got their own supplies. Fresh new pointy Crayola crayons, Prang watercolors (the only ones on the market so far as I remember), Husky pencils with a little shaving carved off near the eraser so you could put your name on it, Pink Pearl erasers. Notebook paper, scissors, a ruler — whatever the parents thought appropriate, or maybe the teacher sent a list. Oh how things have changed. Nowadays — and this pains me more than it ought, perhaps — many or most supplies are pooled. I suppose there is a good reason for this, and having just spent a few minutes reading up on it I see there are pros and cons (and many very angry people with rabid opinions and plenty of time to voice them) so that’s a different issue. My issue is that for a six year old I am expected to hunt down and purchase Ticonderoga brand pencils — three boxes of 24 pencils, or 72 pencils in all. Question number one is, what the hell are they doing with all these pencils? Say there are twenty kids in her class (I’m sure there are more, but for argument’s sake let’s just keep it simple and say twenty). That is 1, 440 pencils, for a nine-month school year. That’s eight pencils per month per kid. Really? My kid will use up 2 pencils a week? In first grade? I’m finding that hard to believe. Also: regular old yellow #2 pencils are no longer good enough for students? I have to buy the Cadillac of yellow #2 pencils, which features, and I do quote, an “exclusive graphite core formula” to give you “extra smooth performance”? Is this a writing instrument or a golf club? I went to the local purveyor of school supplies and there were no such pencils in sight. There were boxes and boxes of nice yellow #2 pencils but not the specific brand requested. I ended up buying the regular ones. So sue me, school supply police. I’m not made of money and I don’t have time to visit specialty office supply stores on the hunt for Ticonderogas. Rhonda has it even worse: while I get off lightly with four 24-color boxes of crayons, she is expected to provide a package of 8 Crayola Twistables crayons. For five year olds, who use regular crayons at home? First off, the crayons I bought are on sale for as little as 15 cents a box. I don’t therefore mind buying four of them, as it costs practically nothing. These Twistable ones are ridiculously expensive. Secondly, we have looked in vain at several stores. We can only find 18-packs which cost upwards of six dollars. For crayons. For a five year old. Who will drop them, break them, lose them.